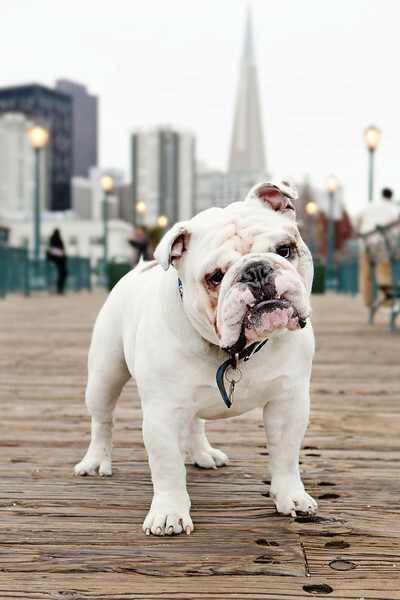 Kira Stackhouse is an award-winning, San Francisco-based animal and pet photographer. Her modern, colorful images of animals have been featured in books, magazines and websites nationwide. She has photographed more than a thousand rescue dogs and cats, helping them find homes in the San Francisco Bay Area. Kira is the creator and author of Project DOG, an online movement to promote responsible pet ownership. In her free time, Kira hangs out with her dogs and cats, and competes in triathlons and half marathons. She loves egg sandwiches, french fries, a good cappuccino and pizza that does not flop. How did you get involved with photography and find your love for pet portraiture? Photography’s always been a hobby of mine, but I never considered it as a potential career. Then a friend asked me to shoot their wedding at City Hall. After that, I ended up shooting weddings for almost three years just from that one City Hall wedding. I learned a lot about running a business, but I knew that photographing weddings wasn’t really what I wanted to do—I wanted to photograph animals. I soon realized quickly that there’s not a really huge perceived value of pet photography; it’s something you need to make people realize they want, which is definitely an ongoing challenge. How did you become successful in such a niche market? When I started my business, I realized early on that opportunities are everywhere, and taking advantage of these opportunities is what has and still helps me stay in the game. Experimentation is key. You can read all of the business and marketing books you want, but until you try something, you will never know if it works. For many people, seeing is believing. Part of the “art” of marketing is selling yourself as an artist because, essentially, that’s what people are buying. Most of my work comes from word of mouth, so the most important tip would be to help people realize your service is something they don’t necessarily just want, but need. Being a photographer is not just about shooting photos, it’s about operating a business and creating relationships. There are a lot of moving parts to operating a business, and it’s important to understand that the photos are only part of the puzzle. Are there similarities in your approach to photographing people versus photographing their pets? It’s very similar because I approach every session the same way. I approach each image from a technical standpoint first: where is my subject going to be in relation to the background, what’s going to be in the background, what are the colors looking like, how do they interact together? For me, it’s more objective before it is subjective. It just so happens that dogs are my favorite thing to shoot. 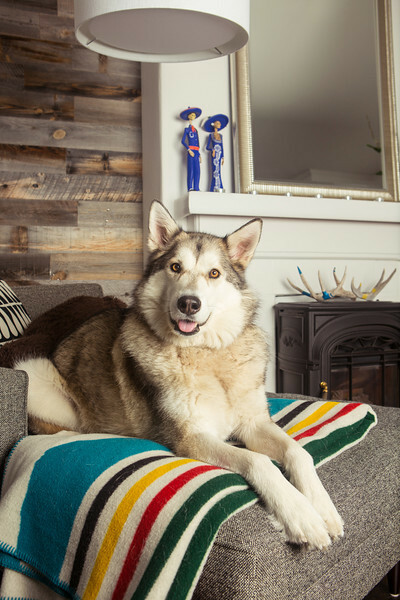 Do you have any tips when photographing owners and their pets together? When I photograph pets, I always require that the owner be present. I don’t like to overwhelm the photo session with extra people, so I usually go to a shoot alone or sometimes with an assistant (but usually just me). 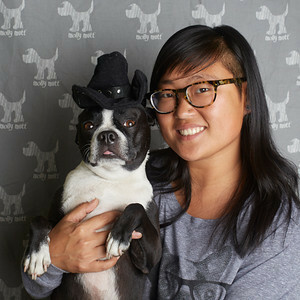 I really depend on the pet parent to play a role in the photo shoot. No one can train or wrangle your pet the way you can as a parent, so I really depend on them to help. I also shoot very spontaneously. A lot of my work may look like it’s posed, but it’s actually not—they’re fleeting moments. 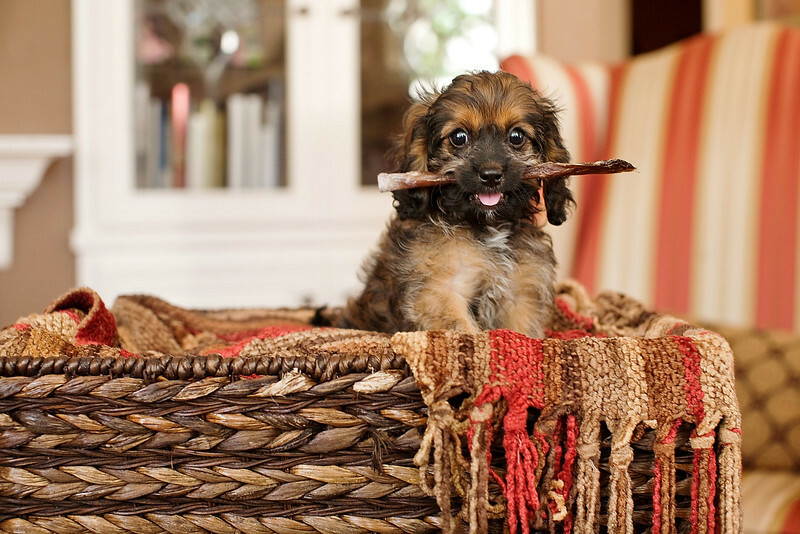 In addition to getting the parents involved, do you have any other tips and tricks for getting great pet portraits? People usually stand up when they take pictures of their pets, but if you just squat down so you’re closer to the eye level of the animal, that will help improve animal photos. Getting below the eye level of your pet will also make the photos more dramatic! Shooting outside is also good. And I always use the sun as my main light source. If you position yourself across from the sun so it’s shining in your dog’s face, that will light the photo naturally for you. You won’t have any crazy shadows, and your pet won’t be backlit. And always pay attention to the horizon line. 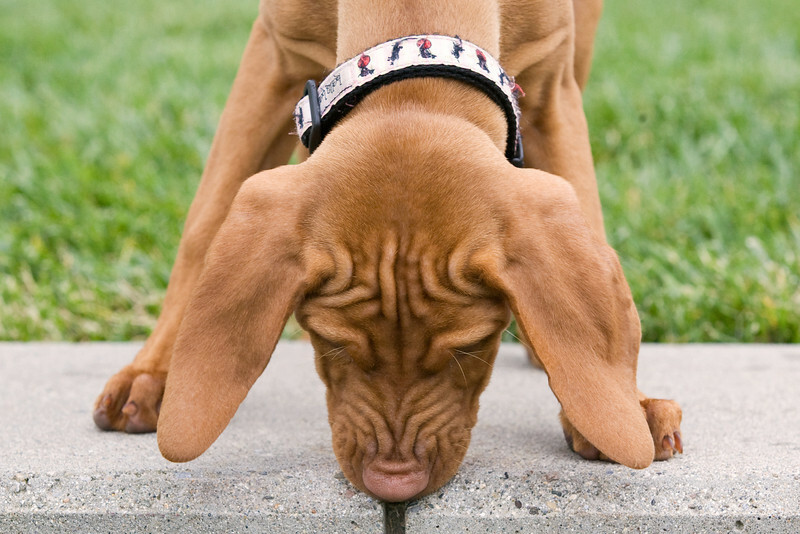 Make sure the ground or the object your pet is on is completely horizontal. If the horizon line is parallel with the bottom of your frame, then the photo looks more balanced. You recently published Project DOG, which has been doing well. Do you have any advice for publishing successfully? I think what you really need to do to be successful is have a clear business plan for your book. Like who is your book going to target? It’s more business than design or content. You need to figure out how you’re going to sell this book, who you are going to sell it to, where you’re going to sell it, and how you’re going to get the word out about it. Otherwise you won’t sell any books. And that was a challenge for me. Basically, Project DOG was my ticket out of my full-time job. I knew the only way I could quit my full-time job is if I had something that would generate income for me in the long term. After getting my first dog, Harley (a Boston terrier), in 2008, I started volunteering with various rescues around San Francisco. I was committed to becoming the best dog parent I could be! But after volunteering a few times, I was surprised by the negative feedback I was getting for not having rescued a dog. Immediately I became “one of them” in the eyes of rescue people, and I knew I had to do something positive that would bring people together and help them realize we’re all in it for the same reason: love of dogs. I decided I wanted to do a book that promotes the idea of being a responsible dog owner, so I started Project DOG. People began to submit their dogs’ photos and stories online, and I posted each submission I received on the web site for viewers to read and share. I received over 4,000 submissions around the country and the world. I was able to find and photograph 170 dog breeds (a dog from a breeder and a dog from a rescue of each breed), all living within a two-hour radius of San Francisco. Crazy! I never thought I would be able to find that many breeds. 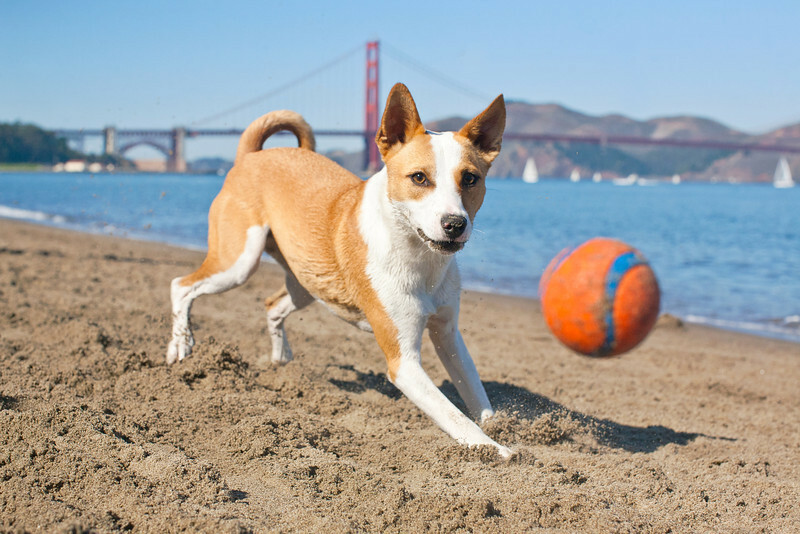 Flash forward, and Project DOG is now in 13 stores so far in the Bay Area. And I’m still selling them online. Do you have any tips for creating a successful business plan? I know it’s the digital age, but what really helped me most was my “idea book.” Write down every idea you have about your new business— what kind of people you want to attract, how you will market to these people, where you will operate your business, etc. Be specific! Writing things down really helps flush out your ideas, better than typing. Also, talk to other photographers and ask them for business tips; everyone runs their business a different way. Photography, like any business, relies heavily on creating relationships. You have to put yourself out there. You can’t rely on luck in business. You have to be prepared, and flexible, for any situation. My tip for people who want to transition from working full time to being self-employed is to get your business going while you are still working. Financially, it doesn’t make sense to quit your job and hope that your business takes off. Anything can happen, and it’s always smart to have a backup plan, so if you’re serious about starting a business, start off part time first. Shoot on weekends and book sessions after work. See if you actually like it, because you might not. It can be very overwhelming once you take the leap as a self-employed person. Going from having a steady paycheck to needing to figure out where your money is coming from can be very stressful (and/or exciting)! Which features do you love the most? I like the folder and subfolder functionalities. 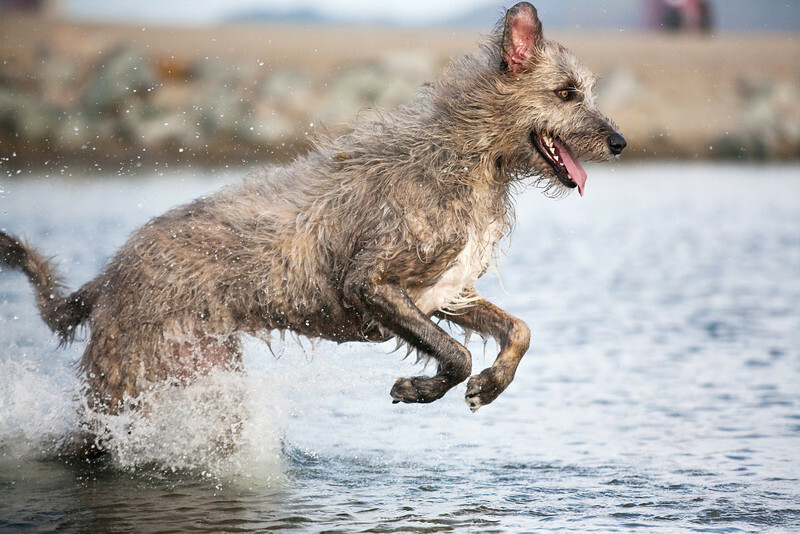 I can organize by different folders, like dogs or landscapes, because I do travel photography, too, and break those down into subfolders, which I’ve been using so I can organize all my dogs by breed. This way I can give someone who wants only dog photos a link to only the dogs, or even to a specific folder of dog breed. I really love the new back-end user interface, too. It’s so clean and modern now, and very intuitive—a lot easier to use. And it’s super fast. It’s like so fast to upload! But my most favorite feature of SmugMug is the unlimited storage—I’m able to upload high-res files of all my images and have the peace of mind that I can access them anytime to re-download. It’s been the perfect way to both display and archive my work. How have your clients liked your updated site? They really like it. They really like the full-width slideshow, and it’s really easy to share albums and individual photos. They always say it’s easy to use and people can easily figure out how to order prints. Now that the new SmugMug has all these different themes to choose from, it’s been a lot easier for me to make it match the feel of my other web site, which is purely informational. So it’s helped make consistent branding for me and my clients a smoother experience. I maintain two sites because I started my original web site for the business in 2006. From an SEO standpoint, I don’t want to lose my traffic or page rankings by leaving this site. It’s also good to be able to cross-link between sites, which encourages link building. Have the SmugMug social-media tools helped you on that front? The sharing functionality is great, and I know a lot of my clients use the share links in their galleries. I always encourage people to share the images they like on their social networks!